Property & building maintenance services sums up everything we do. it ranges from small jobs around the home to full home refurbishments, hanging pictures, decorating, laying carpets, making roof repairs to name a few. Handyman Manchester pride ourselves on carrying out all home and office repair and maintenance work in an efficient manner, good pricing and doing an great job. Whether its you have one job or many that need doing we are always happy to offer a free fixed quote . All prices are written down so there are no hiiden extras or grey areas when it comes to what we expect from each other. We do single projects or you like can contact for ongoing property maintenance, prevention is always cheaper than the cure. Handyman Manchester work across the whole Manchester area on a every type of building these include houses, flats, offices, apartments and factories/industrial units. Handyman Manchester offer a full solution to home maintenance, refurbishments and property repair issues. We have a large clients base around Manchester and we have achieved this by providing all our clients with a great service at the right price, with a friendly, trustworthy team always willing to go that extra mile to help you get te result you are looking for. If having a great looking property is your aim then look no further our painters and decorators in Manchester have all the skills and experience required to make that happen. Skilled in all aspects of the trade there is no need for multiple tradesmen to assist when decorating your property because if you need a light fitting moved or a radiator taken off for access we can do that too saving you the time and money to get an electrician and a plumber in to do the jobs which will make your property get the right finish. 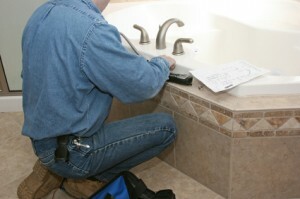 If its a bathroom fitter in Manchester you need then your in the right place. We can fit new bathrooms, wet rooms, replace bathroom furniture or just freshen up your old bathroom with new tiles and flooring, whatever your project Handyman Manchester are here to help. Kitchen Fitting is a job that has to be done properly, the smallest of errors can make a brand new kitchen look awful and so when choosing a kitchen fitter be sure that the person doing it has experience and a good portfolio of previous work is paramount. Property maintenance is our bread and butter, we enjoy transforming lifeless properties to amazing looking homes.